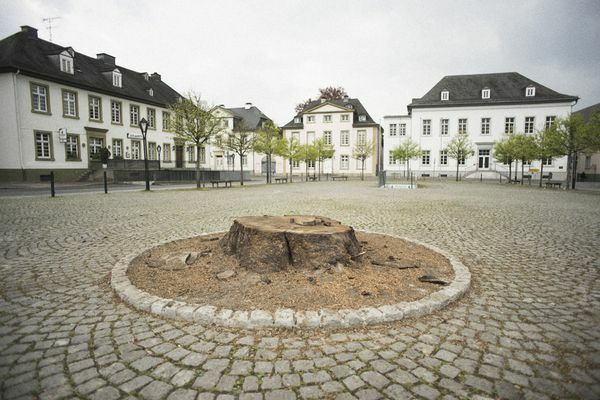 We find a large stump of a hundreds-year-old oak in the center of Neumarkt square in Arnsberg. Symbolizing permanence and majesty, a historical focal point for city and municipality, as well as a protection and refuge, this mother oak is gone now. Traces prove that it has been recently felled. Did the city grow around this tree and lost it now? The stately tree is though still recognizable in the imagination of the viewer. Bismarck is interested in the relation between construction of reality and perception of nature. His stump is a survivor of a fictional reality and was posthumously written into the history of Arnsberg. Julius von Bismarck (b. 1983) grew up in Riad (Saudi Arabia) and Berlin, where he currently lives. He studied Visual Communication and Fine Arts in Berlin and New York and is graduate of Olafur Eliasson’s Institute for Spatial Experiments (2013). Bismarck is winner of the Prix Ars Electronica Collide at CERN 2012. His works were recently exhibited at Hamburger Kunsthalle (2014), Winzavod Moscow (2014), Künstlerhaus Bethanien Berlin (2013), Palais de Toyko Paris (2013), Family Business New York (2012). "History Apparatus" is a new public art work commissioned by Kunstverein Arnsberg 2014.